We all know that the sun gives off UV light that damages our skin, but do you also know that it can damage your car? Living in Singapore where the summer season is all year round, you need to be better prepared to protect your beloved car from sun damage! 1. Use windshield sun shade. Too much sunlight will cause your dashboard and steering wheel to suffer if you park your car under the sun. To protect the interior of your car, use a windshield sun shade to reduce the heat that’s beaming down. You may also choose to use one for your rear windshield. You could consider tinting your windows as an option, if you frequently park your car in the sun. Your front windshield and two front side windows should allow 70% of light through, while the rear windows and rear passenger windows require at least 25%. Do also note that front windshield tint shouldn’t obstruct the IU transactions on ERPs. 3. Park in the shade. Park your car in an indoor car-park or shady spot whenever possible. 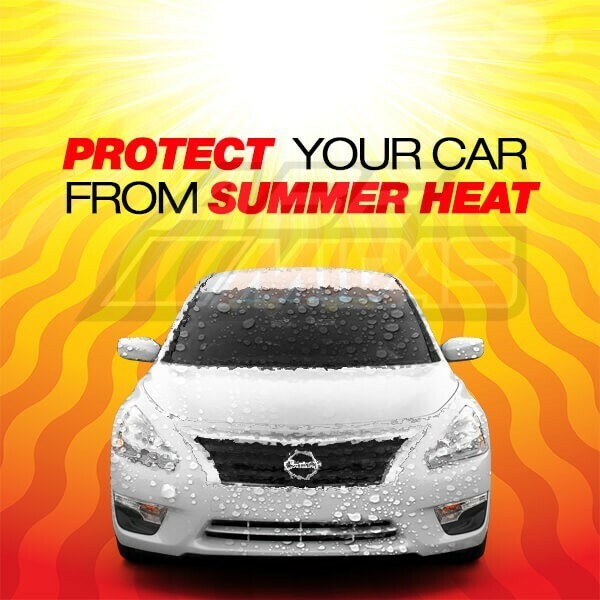 This is the best way to protect your car’s paintwork and also reduce the heat damage to your interior. 4. Do a monthly check on your tyre pressure. When you’re constantly driving in hot weather, your tyres tend to inflate due to the rising temperature. And when your inflated tyres come into contact with the hot road surfaces, the added friction combined with high speeds will cause your tyres to blowout easily! That is why you need to perform checks on your tyre pressure at least once a month to ensure that your tyres are correctly inflated. 5. Clean your interior periodically. Dust combined with the heat can fade and weaken your car’s interior. To protect your interior components and the upholstery, conduct regular cleaning to prevent potential damages. Keep in mind to use cleaning products that are intended for automobile use, or you may also use coffee filter or olive oil. 6. Invest in paint protection film. To protect for the exterior from sun damage, you may consider investing in a paint protection film kit that doesn’t interfere with the beauty of your car. This invisible shield can also protect your car from small dents, sand and minor scratches! Use a protective wax at least twice a year to lock the natural oils into the paintwork. Waxing also provides an extra layer of protection for your exterior from the sun’s rays! 8. Check your coolant regularly. Fluids in your car get used up faster in hot weather conditions and this increases the risks of damage to your car. If the fluid levels are low, top up your coolant when necessary. Do note that you shouldn’t open the cap when the car is still running hot! Previous post: Why Cars Overheat & What To Do About It. Practical Tips. Next post: What Is The Best Outdoor Car Cover For The Climate I Live In?